Offering Des Moines’ businesses a convenient and affordable way to keep their fleet vehicles looking good. Spotfree Car Wash offers commercial fleet accounts for companies looking for a convenient and affordable way to maintain the appearance of their vehicle fleet. We offer monthly billing with the ability to have multiple cards on one account or separate accounts within the company. Detailed reporting on each card showing the amount charged, services used and the location is available monthly and there is no charge for issuing the cards. The accounts can be active at all of our locations or the one(s) you select when setting up the account. The touch-free or self service bays can be used with the fleet card. Fleet accounts set up to be paid monthy with a credit card can be ready to go in as little as 1-2 days. Net 30 accounts typically take 3-5 business days to set up when references are supplied. 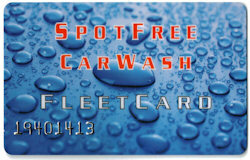 Discounts on fleet accounts are based on the size of the account and monthly wash use. Please contact us for more information.